Home › Toys › Stonkraft Collectible Folding Wooden Chess Game Board Set With Magnetic Craft..
Stonkraft Collectible Folding Wooden Chess Game Board Set With Magnetic Craft..
12" x 12" made from Premium Quality Indian Rosewood & Boxwood. Chess pieces included. Handcrafted Folded Chess Board made on Wooden Base with inlaid Wooden Square. 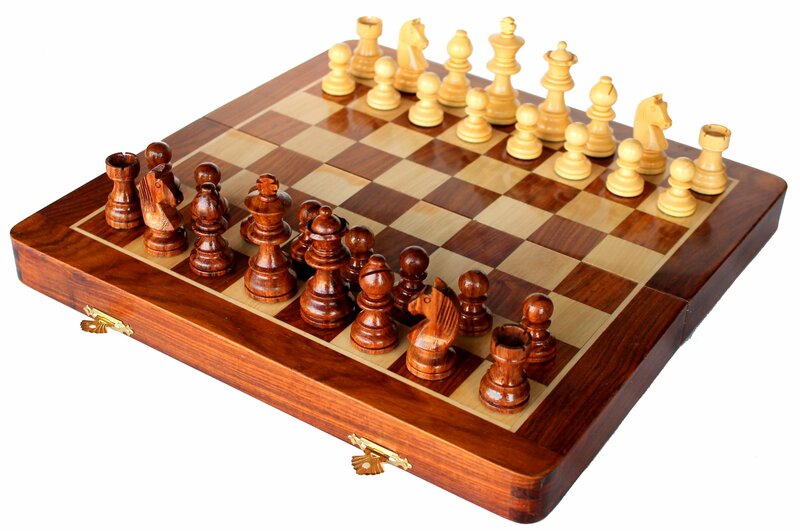 Board size : 12" x 12" (Open), 12" x 6" (Folded) King Height : 2.25"
Pieces are made of Brown/Yellow Polished RoseWood. Size: 12 Inch x 12 Inch Handcrafted Folded Chess Board made on Wooden Base with inlaid Wooden Square.Staunton Pawns also made of Brown/Yellow Polished Wood. Lovely HandcraftedChess board for your living room. Hand carved Indian Wooden chess set. for 12"x 12" square Board, King is almost 2.25" high and others pieces size accordingto the King Size. The main colors of Wood used on this chess set . Board isalso decorated with wood inlays. All pieces are hand carved. Chess Set itselfis having storage for all of it 32 pawns and is laced with satin feel cloth.As it can be seen in picture, Main Box is Wooden and Wooden Inlays have beenplaced on top of the wooden box. Wooden Box also works as storage to keep thepieces.